Weird fiction is a subgenre of speculative fiction originating in the late 19th and early 20th centuries. John Clute defines weird fiction as a "Term used loosely to describe Fantasy, Supernatural Fiction and Horror tales embodying transgressive material". China Miéville defines weird fiction thus: "Weird Fiction is usually, roughly, conceived of as a rather breathless and generically slippery macabre fiction, a dark fantastic ("horror" plus "fantasy") often featuring nontraditional alien monsters (thus plus "science fiction")." Discussing the "Old Weird Fiction" published in the late 19th and early 20th centuries, Jeffrey Andrew Weinstock says, "Old Weird fiction utilises elements of horror, science fiction and fantasy to showcase the impotence and insignificance of human beings within a much larger universe populated by often malign powers and forces that greatly exceed the human capacities to understand or control them." Weird fiction either eschews or radically reinterprets ghosts, vampires, werewolves, and other traditional antagonists of supernatural horror fiction. Weird fiction is sometimes symbolised by the tentacle, a limb-type absent from most of the monsters of European folklore and gothic fiction, but often attached to the monstrous creatures created by weird fiction writers such as William Hope Hodgson, M. R. James, and H. P. Lovecraft. Weird fiction often attempts to inspire awe as well as fear in response to its fictional creations, causing commentators like Miéville to say that weird fiction evokes a sense of the numinous. Although "weird fiction" has been chiefly used as a historical description for works through the 1930s, the term has also been increasingly used since the 1980s, sometimes to describe slipstream fiction that blends horror, fantasy, and science fiction. John Frederick Clute is a Canadian-born author and critic specializing in science fiction and fantasy literature who has lived in both England and the United States since 1969. He has been described as "an integral part of science fiction's history" and "perhaps the foremost reader-critic of sf in our time, and one of the best the genre has ever known." Fantasy is a genre of speculative fiction set in a fictional universe, often inspired by real world myth and folklore. Its roots are in oral traditions, which then became literature and drama. From the twentieth century it has expanded further into various media, including film, television, graphic novels and video games. 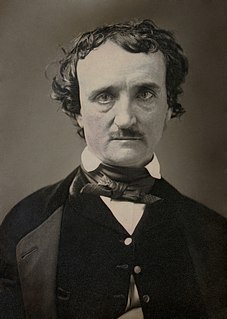 Edgar Allan Poe was an American writer, editor, and literary critic. Poe is best known for his poetry and short stories, particularly his tales of mystery and the macabre. He is widely regarded as a central figure of Romanticism in the United States and of American literature as a whole, and he was one of the country's earliest practitioners of the short story. He is generally considered the inventor of the detective fiction genre and is further credited with contributing to the emerging genre of science fiction. He was the first well-known American writer to earn a living through writing alone, resulting in a financially difficult life and career. Supernatural fiction or supernaturalist fiction is a genre of speculative fiction exploiting or requiring as plot devices or themes some contradictions of the commonplace natural world and materialist assumptions about it. "Supernatural Horror in Literature" is a long essay by American writer H. P. Lovecraft, surveying the topic of horror fiction. It was written between November 1925 and May 1927 and revised during 1933–1934. It was first published in 1927 in the one-issue magazine The Recluse. More recently, it was included in the collection Dagon and Other Macabre Tales (1965). The true weird tale has something more than secret murder, bloody bones, or a sheeted form clanking chains according to rule. A certain atmosphere of breathless and unexplainable dread of outer, unknown forces must be present; and there must be a hint, expressed with a seriousness and portentousness becoming its subject, of that most terrible conception of the human brain—a malign and particular suspension or defeat of those fixed laws of Nature which are our only safeguard against the assaults of chaos and the daemons of unplumbed space. Sunand Tryambak Joshi, known as S. T. Joshi, is an American literary critic, novelist, and a leading figure in the study of H. P. Lovecraft and other authors of weird and fantastic fiction. Besides having written what critics such as Harold Bloom and Joyce Carol Oates consider to be the definitive biography of Lovecraft, I Am Providence: The Life and Times of H. P. Lovecraft, Joshi has prepared several annotated editions of works by Ambrose Bierce. He has also written on crime novelist John Dickson Carr and on Lord Dunsany, Algernon Blackwood and M. R. James, and has edited collections of their works, as well as collections of the best work of numerous other weird writers. Fantastique is a French term for a literary and cinematic genre that overlaps with science fiction, horror, and fantasy. A ghost story may be any piece of fiction, or drama, that includes a ghost, or simply takes as a premise the possibility of ghosts or characters' belief in them. The "ghost" may appear of its own accord or be summoned by magic. Linked to the ghost is the idea of "hauntings", where a supernatural entity is tied to a place, object or person. 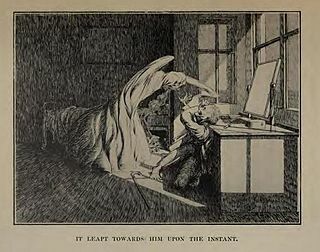 Ghost stories are commonly examples of ghostlore. China Tom Miéville is a British urban fantasy fiction author, essayist, comic book writer, socialist political activist and literary critic. He often describes his work as weird fiction and allied to the loosely associated movement of writers sometimes called New Weird. 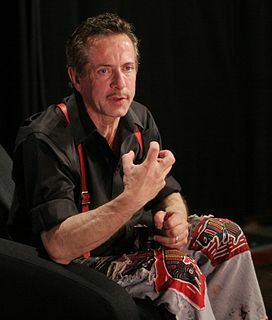 Clive Barker is an English writer, film director, and visual artist. Barker came to prominence in the mid-1980s with a series of short stories, the Books of Blood, which established him as a leading horror writer. He has since written many novels and other works, and his fiction has been adapted into films, notably the Hellraiser and Candyman series. He was also the executive producer of the film Gods and Monsters. Ramsey Campbell is an English horror fiction writer, editor and critic who has been writing for well over fifty years. He is the author of over 30 novels and hundreds of short stories, many of them widely considered classics in the field. Three of his novels have been filmed, all for non-English-speaking markets. The following notable authors have been described as writers of weird fiction. They are listed alphabetically by last name. Ryūnosuke Akutagawa, art name Chōkōdō Shujin (澄江堂主人) was a Japanese writer active in the Taishō period in Japan. He is regarded as the "Father of the Japanese short story" and Japan's premier literary award, the Akutagawa Prize, is named after him. He committed suicide at the age of 35 through an overdose of barbital. Ambrose Gwinnett Bierce was an American short story writer, journalist, poet, and Civil War veteran. Algernon Henry Blackwood, CBE was an English broadcasting narrator, journalist, novelist and short story writer, and among the most prolific ghost story writers in the history of the genre. The literary critic S. T. Joshi stated, "His work is more consistently meritorious than any weird writer's except Dunsany's." and that his short story collection Incredible Adventures (1914) "may be the premier weird collection of this or any other century". 1 2 3 4 John Clute, "Weird Fiction", in The Encyclopedia of Fantasy , 1997. Retrieved 29 September 2018. 1 2 3 4 5 6 7 8 9 10 11 12 13 14 15 16 17 18 19 20 21 22 China Miéville, "Weird Fiction",in: Bould, Mark et al. The Routledge Companion to Science Fiction. New York: Routledge, 2009. ISBN 0-415-45378-X (p. 510-516). 1 2 3 4 5 6 7 8 9 10 11 12 13 14 15 16 17 18 19 20 21 22 23 24 25 26 27 28 29 30 31 32 33 34 35 36 37 38 39 40 41 42 VanderMeer, Ann and Jeff. "The Weird: An Introduction". Weird Fiction Review. Retrieved 7 June 2014. 1 2 Joshi, S. T. (1990). The Weird Tale. University of Texas Press. ISBN 0-292-79050-3. ↑ "Bates had an affinity for weird fiction, but Strange Tales didn't go in for Lovecraft's brooding, wordy atmospherics." Ed Hulse, The Blood 'n' Thunder Guide to Pulp Fiction. Murania Press, Morris Plains, New Jersey, 2018. ISBN 978-1726443463. (pp.130-131). ↑ Joshi, S.T. "Introduction". The Weird Tale. 1 2 Gordon, Joan (2003). "Reveling in Genre: An Interview with China Miéville". Science Fiction Studies. 30 (91). ↑ Jerry L. Ball, "Guy Endore's The Werewolf of Paris: The Definitive Werewolf Novel?" Studies in Weird Fiction, No. 17: pp. 2-12. Summer 1995. ↑ Timothy Jarvis, 101 Weird Writers #45 — Stefan Grabiński , Weird Fiction Review, December 20, 2016. Retrieved September 1 2018. ↑ "Twice-Told Tales...and Mosses From an Old Manse (1846; 23s) include most of Hawthorne's weird fiction. " Michael Ashley, Who's Who in Horror and Fantasy Fiction. Taplinger Publishing Company, 1978. ISBN 9780800882754 (p.90). ↑ Gauvin, Edward. "Kavar the Rat" . Retrieved 7 June 2014. ↑ Nolen, Larry. "Weirdfictionreview.com's 101 Weird Writers: #3 – Julio Cortázar". Weird Fiction Review. Retrieved 1 September 2014. ↑ "...the cartoonist Gahan Wilson, whose thirty-odd- year sideline as an occasional writer of weird fiction has now heaped up enough oddments to fill a book." Brian Stableford, News of the Black Feast and Other Random Reviews. Rockville, Maryland : The Borgo Press, (p. 131) ISBN 9781434403360. 1 2 3 VanderMeer, Ann; Jeff VanderMeer (2008). The New Weird. Tachyon. pp. xvi. ISBN 978-1-892391-55-1. Howard Phillips Lovecraft was an American writer who achieved posthumous fame through his influential works of horror fiction. He was virtually unknown during his lifetime and published only in pulp magazines before he died in poverty, but he is now regarded as one of the most significant 20th-century authors of horror and weird fiction. Horror is a genre of speculative fiction which is intended to frighten, scare, disgust, or startle its readers by inducing feelings of horror and terror. Literary historian J. A. Cuddon defined the horror story as "a piece of fiction in prose of variable length... which shocks, or even frightens the reader, or perhaps induces a feeling of repulsion or loathing". It creates an eerie and frightening atmosphere. Horror is frequently supernatural, though it can be non-supernatural. Often the central menace of a work of horror fiction can be interpreted as a metaphor for the larger fears of a society. 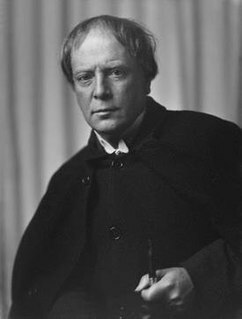 Arthur Machen was the pen-name of Arthur Llewellyn Jones, a Welsh author and mystic of the 1890s and early 20th century. He is best known for his influential supernatural, fantasy, and horror fiction. His novella The Great God Pan has garnered a reputation as a classic of horror, with Stephen King describing it as "Maybe the best [horror story] in the English language." He is also well known for "The Bowmen", a short story that was widely read as fact, creating the legend of the Angels of Mons. Weird Tales is an American fantasy and horror fiction pulp magazine founded by J. C. Henneberger and J. M. Lansinger in late 1922. The first issue, dated March 1923, appeared on newsstands February 18. The first editor, Edwin Baird, printed early work by H. P. Lovecraft, Seabury Quinn, and Clark Ashton Smith, all of whom would go on to be popular writers, but within a year the magazine was in financial trouble. Henneberger sold his interest in the publisher, Rural Publishing Corporation, to Lansinger and refinanced Weird Tales, with Farnsworth Wright as the new editor. The first issue under Wright's control was dated November 1924. The magazine was more successful under Wright, and despite occasional financial setbacks it prospered over the next fifteen years. Under Wright's control the magazine lived up to its subtitle, "The Unique Magazine", and published a wide range of unusual fiction. "The Colour Out of Space" is a science fiction/horror short story by American author H. P. Lovecraft, written in March 1927. In the tale, an unnamed narrator pieces together the story of an area known by the locals as the "blasted heath" in the wild hills west of the fictional town of Arkham, Massachusetts. The narrator discovers that many years ago a meteorite crashed there, poisoning every living being nearby; vegetation grows large but foul tasting, animals are driven mad and deformed into grotesque shapes, and the people go insane or die one by one. Frank Belknap Long was an American writer of horror fiction, fantasy, science fiction, poetry, gothic romance, comic books, and non-fiction. Though his writing career spanned seven decades, he is best known for his horror and science fiction short stories, including early contributions to the Cthulhu Mythos. During his life, Long received the World Fantasy Award for Life Achievement, the Bram Stoker Award for Lifetime Achievement, and the First Fandom Hall of Fame Award (1977). The new weird is a literary genre that began in the 1990s and developed in a series of novels and stories published from 2001 to 2005. M. John Harrison is credited with creating the term "New Weird" in the introduction to China Miéville's novella The Tain (2002). The writers involved are mostly novelists who are considered to be parts of the horror or speculative fiction genres but who often cross genre boundaries. Notable authors include K. J. Bishop, Steve Cockayne, Paul Di Filippo, M. John Harrison, Thomas Ligotti, Ian R. MacLeod, China Miéville, Alastair Reynolds, Justina Robson, Steph Swainston, and Jeff VanderMeer, among others. Theodore "Eibon" Donald Klein is an American horror writer and editor. Joseph Payne Brennan was an American writer of fantasy and horror fiction, and also a poet. Of Irish ancestry, he was born in Bridgeport, Connecticut and he lived most of his life in New Haven, Connecticut, and worked as an Acquisitions Assistant at the Sterling Memorial Library of Yale University for over 40 years. Brennan published several hundred short stories, two novellas and reputedly thousands of poems. His stories appeared in over 200 anthologies and have been translated into German, French, Dutch, Italian and Spanish. He was an early bibliographer of the work of H.P. Lovecraft. Farnsworth Wright was the editor of the pulp magazine Weird Tales during the magazine's heyday, editing 179 issues from November 1924-March 1940. Jack Williamson called Wright "the first great fantasy editor". The Three Impostors; or, The Transmutations is an episodic horror novel by British writer Arthur Machen, first published in 1895 in The Bodley Head's Keynote Series. It was revived in paperback by Ballantine Books as the forty-eighth volume of the Ballantine Adult Fantasy series in June 1972. Necronomicon Press is an American small press publishing house specializing in fiction, poetry and literary criticism relating to the horror and fantasy genres. It is run by Marc A. Michaud. Richard Louis Tierney is an American writer, poet and scholar of H. P. Lovecraft. He is the coauthor of a series of Red Sonja novels, featuring cover art by Boris Vallejo. 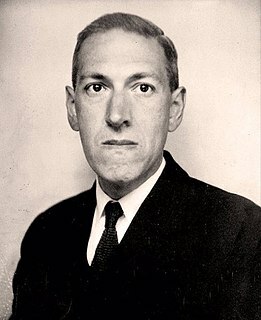 Some of his standalone novels utilize the mythology of Lovecraft's Cthulhu Mythos. Robert Barbour Johnson (1907–1987) was an artist and writer of weird fiction, whose stories were admired by H.P. Lovecraft. Johnson wrote "Far Below" (1939), voted in 1953 by readers as the best story ever published in Weird Tales magazine. This story is still well regarded, and continues to be regularly anthologized in major collections such as The Weird (2010) and The Century's Best Horror Fiction (2012). Strange Tales was a U.S. pulp magazine first published from 1931 to 1933 by Clayton Publications. It specialized in fantasy and weird fiction, and was a significant competitor to Weird Tales, the leading magazine in the field. Its published stories include "Wolves of Darkness" by Jack Williamson, as well as work by Robert E. Howard and Clark Ashton Smith. The magazine ceased publication when Clayton entered bankruptcy. It was temporarily revived by Wildside Press, which published three issues edited by Robert M. Price from 2003 to 2007. Joshi, S. T. (1990). The Weird Tale. University of Texas Press. ISBN 0-292-79050-3. Blog devoted to the English writer W.H. Hodgson, pioneer in the weird tale. H.P. Lovecraft, "Supernatural Horror in Literature"
H.P. Lovecraft, "Notes on Writing Weird Fiction"